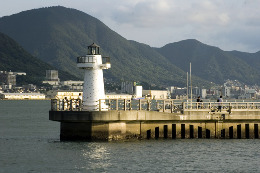 The industrial town of Shimonoseki (pop. 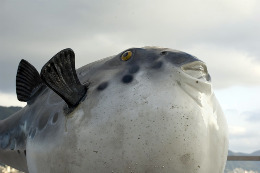 246,000) is not a major tourist destination. Its history and strategic location at the tip of Western Honshu are however of considerable interest. It is off the coast of Shimonoseki that one of the most important naval battles in medieval Japan took place. In 1185, The Minamoto clan defeated for good their rivals, the Taira clan, at the battle of Dan-no-Ura. The Taira leader Taira no Tomomori threw himself into the sea rather than surrender. The same fate was to be forced upon the child-emperor Antoku, grand-son of Taira no Kiyomori, and his grand-mother (Tomomori's mother). 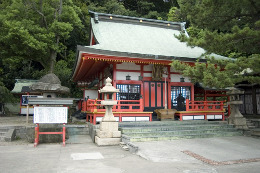 The Akama-jingu Shrine (赤間神宮), 3 km east of Shimonoseki station, is dedicated to Antoku. Shimonoseki is now famous for fugu (blowfish) and the view on the Kanmon straits from the top of the 238m Mount Hino-yama. The 360-degree views from the 143m-high Kaikyo Yume Tower are absolutely splendid when the weather allows. This only almost justifies a visit to Shimonoseki if you are in the region. Admission to the observatory is ￥600. If you have time to kill between two trains, you can stroll along the straights between Akama-jingu and Kamon Wharf, and have a look around the Karato Fish Market. There are a few unpretentious Western-style buildings behind Kamon Wharf: the former British Consulate, the Shimonoseki Nambunchō Post Office and the old Akita Company Building. Still along the wharf is the Shimonoseki Municipal Aquarium (open 9:30am-5:30pm, ￥1,800), which opened in 2001 and boasts dolphins, fugu and uni (sea urchins) among others. Also note a bizarre replica of London's St Paul's cathedral in front of the train station. Shimonoseki is the last train station on Honshu before crossing to Kyushu. The shinkansen does not stop at Shimonoseki, but at Kokura, 15min from there on the JR Sanyo main line. It is another 15min from there to Hakata/Fukuoka (￥1,320 altogether). From Kokura, it is 20min by Shinkansen to Shin-Yamaguchi (￥1,620), 55min to Hiroshima (￥3,570), 2h30min to Osaka (￥8,510) or 5h15min to Tokyo (￥12,810). Regular trains take 1h from Shimonoseki to Yamaguchi (￥1,450). Nishitetsu has buses to/from Hakata/Fukuoka (1h40min, ￥1,500). The nearest airports are Yamaguchi-Ube (1h25min by bus, ￥1,400) or Kita-Kyūshū (45min by bus, ￥610), both with flights to Tokyo Haneda only.